Were professionally licensed packers in the Bay Area. We will completely pack and preparing everything in your home for your move. 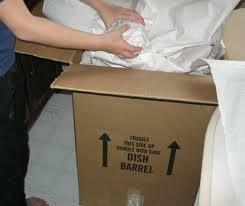 We can also, provide unpack and organized. Weather, your relocating locally or overseas, we know how important it is to keep your belongings secured. We have the experience and latest techniques keeping this transition as smooth as possible. Let us assist you, were punctual efficient and organized. Our hourly rate includes packing material and labor. Save Time, Save Money. Moving overseas? We provide specialty packaging for International moves. We will pack according to transit specifications for all household goods. Including paper padding and shrink wrapping furniture. Our, double/triple wrapping includes: paper padding, corregating and shrink wrapping. All of our packing is done with sensitive pressure tape- which is resistant to moisture and humidity.